After Disney made the massive purchase of Lucasfilm yesterday, Star Wars fans wondered where it all goes from here. Word that an Episode VII was hitting theaters in 2015 had fans wondering if they would see the continuation of the story of Luke Skywalker, Princess Leia, and Han Solo. Much of their story has already been put into numerous books, graphic novels, and video games. In fact Timothy Zahn’s Dark Empire Trilogy – which take place six years after the events of the Empire falling and Luke being drawn into the dark side – could have been one of graphic novels adapted for the next Star Wars trilogy. However it’s been uncovered that Episode VII will in all likelihood be an original story, and not only will they not use any previously created works, but they won’t use any of George Lucas’ old storylines that were suppose to take place after Return of the Jedi. According to E! Online, a source over at Lucasfilm has stated that this new trilogy will be an original story. This could mean that Episode VII will not have any of the original characters seen in the first six Star Wars films. But that remains unconfirmed. 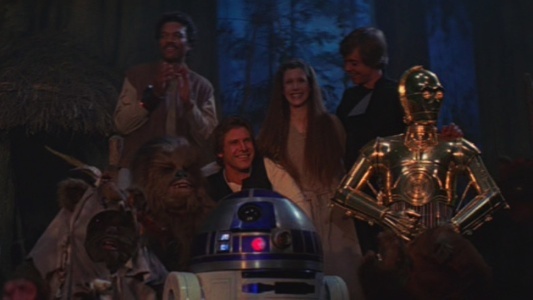 Even if they are original stories it shouldn’t eliminate the possibility that we could still see Luke, Leia, Han, Chewbacca, and everyone’s favorite two droids in future films. Seeing new settings and new characters in the next chapters of the Star Wars saga wouldn’t be that much of a surprise. Pollock has stated that the next trilogy would have focused on Luke Skywalker in his 30s and 40s. However, Mark Hamill is clearly older than 40, I don’t see how casting him as Luke in Episode VII is even remotely possible. They could use the same technology to make him younger the same way they made Jeff Bridges younger in Tron: Legacy, but let’s just consider that an unconfirmed option for now. But tell us your thoughts on these supposed exciting stories for episodes 7,8, and 9. How does it make you feel that they won’t be used? How does it make you feel that we might not even see Luke Skywalker and co. in future films? Is this really the end of the Sith? And if it is, what new threat faces the newly restored peace? There may be a lot of unanswered questions, but as soon as more details about Episode VII come out, you can be sure we will be all over it.